John Martin (1789-1854) was an English Romantic painter and illustrator who frequently painted Biblical scenes, particularly those depicting divine punishment. This representation of the great flood is entirely concerned with the extreme drama that pervades the scene. 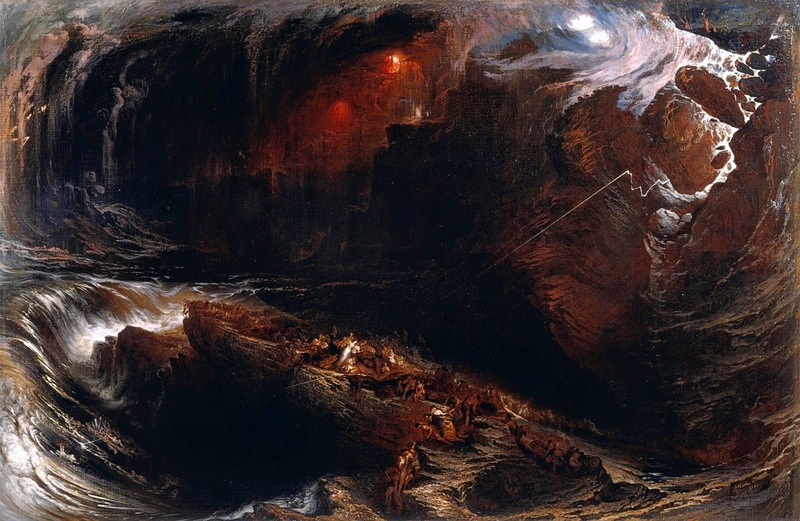 Such darkness and intensity was common in English Romanticism (as I alluded to in a recent post) and this painting takes the concept to extremes. The waves rise hundreds of feet in the air to engulf the land, water churns in every corner of the canvas, lightning blasts through the water on the right, and people cling on for dear life. The people are somewhat hard to make out, but they are clearly in agony as they fall into the sea and are swept away by the surf. A larger but darker version of the image is available here to view these details. Martin's brushwork is quite successful at portraying this dire scene: with sharp lines and jagged edges the drama is heightened with every stroke. One interesting element of the composition is the ovular vortex composition, created here by the arc of the waves over the top of the canvas, which Martin used repeatedly in his Biblical scenes, including another similar depiction of the flood done in mezzotint engraving. Perhaps to Martin it represented the all-encompassing power of God.